When you need a break from your hectic schedule, a trip to the country promises a relaxing and homey respite, and this iconic blue hue embodies that feeling of laid-back escape. 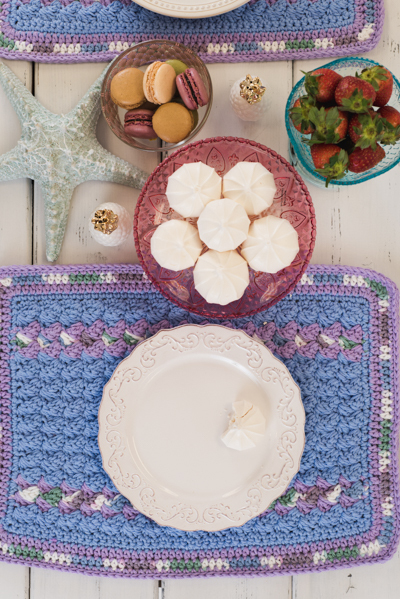 This placemat’s rolling, mesmerizing shell stitch and easily repeatable stripes make it a must-have accessory for the next time you need to make your own home feel like a getaway. 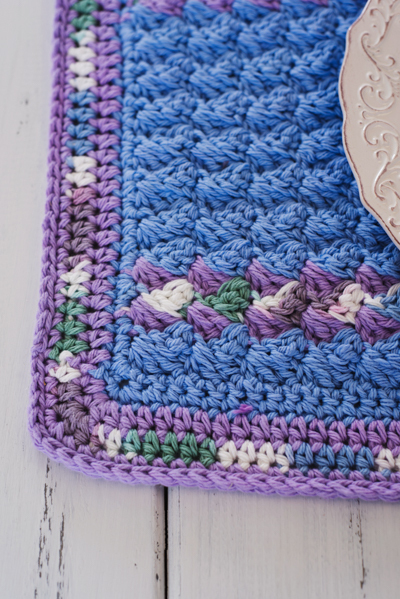 This pattern is worked in simple Shell stitch rows with a 5 rnd border. Row 1: With MC, ch 50, sc in 2nd ch from the hook, sc in each ch across, turn – 49 sts. Row 2: Ch 1, Shell in first st, *sk next 2 sts, Shell in next st; rep from * across, turn – 17 Shells. Row 3: Ch 1, Shell in first sc, Shell in each sc across, turn. Drop MC, but do NOT fasten off. Row 4: With CC2, rep Row 3, turn. Drop CC2, but do NOT fasten off. Row 5: With CC1, rep Row 3, turn. Fasten off. Pick up CC2. Row 6: With CC2, rep Row 3, turn. Fasten off. Pick up MC. Rows 7-20: With MC, rep Row 3, turn. Drop MC at end of last row, but do NOT fasten off. Row 21: With CC2, rep Row 3, turn. Drop CC2, but do NOT fasten off. Row 22: With CC1, rep Row 3, turn. Fasten off. Pick up CC2. Row 23: With CC2, rep Row 3, turn. Fasten off. Pick up MC. Rows 24-25: With MC, rep Row 3, turn. Row 26: Ch 1, sc in each st across, turn – 49 sts. Rnd 27: Ch 1, sc in each st across top (47 sts), 3 sc in corner, 28 sc along short side working in end of rows (sc in end of 6 rows, 2 sc in end of next row), 3 sc in next corner, working in opposite side of starting ch, sc 47 sts across bottom, 3 sc in next corner, 28 sc along short side, 3 sc in last corner, join with sl st in first st. Fasten off – 162 sts. Rnd 28: With CC2, join with sl st in first st, ch 1, hdc in each st around with 3 hdc in each corner st, join with sl st in first st. Fasten off – 170 sts. Rnd 29: With CC1, rep Rnd 28 – 178 sts. Rnd 30: With CC2, join with sl st in first st, ch 1, sc in each st around with 3 sc in each corner st, join with sl st in first st – 186 sts. Rnd 31: Sl st loosely in each st around, join. Fasten off. I too would like to know how many placemats this amount of materials will make. I love this pattern…. 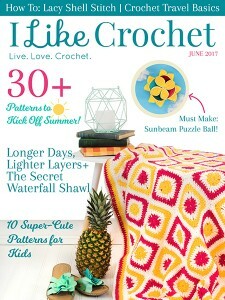 Can’t wait to crochet! Thanks so much! Very pretty. 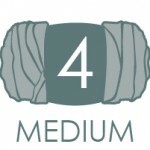 But I didn’t see where it said how many that amount of yarn made?